The U.S. and Mubarak: What Would Reagan Do? His basement office in the White House has low ceilings and no windows. It is an extra-secure enclave within one of the world's most secure buildings, with a keypad lock on its outer door, a gleaming steel safe in its anteroom and a prohibition on electronic devices, such as BlackBerrys and cameras, which could scoop up some of America's most sensitive secrets. The location makes sense. President Obama's top adviser on homeland security and counterterrorism mostly works in the shadows. Brennan's is a world of spycraft and special operations, one requiring a delicate balance between protecting American lives and upholding American values. The job involves some grim conversations with the President. Brennan is often the first to notify Obama when something terrible has happened  he delivered the news that Arizona Congresswoman Gabrielle Giffords had been shot in Tucson  or when word surfaces of a particularly alarming new threat. 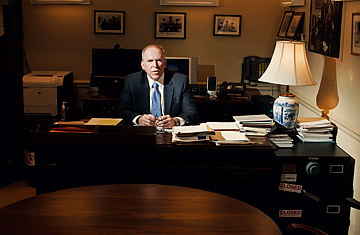 You can imagine that Obama clenches a little when he sees Brennan, with his broad shoulders, thick hands and stern face, appearing in the Oval Office doorway for an unscheduled meeting. "I will not disagree with that view," says Brennan, a career intelligence professional, a muted grin breaking through his poker face. Then he turns serious again: "The issues that I speak to [Obama] about are life-and-death." Brennan's portfolio covers a hair-raising spectrum of horribles, including everything from cyberattacks to earthquakes and pandemics. But his top priority is the continuing threat of radical Islamists who have mounted a series of attacks on the U.S. during Obama's tenure that came close to killing countless innocents. "He has become the de facto head of the intelligence community, at least on terrorism issues," says Bruce Riedel, a former CIA officer and Brennan colleague. He has also become something of a folk hero among Obama aides, who lavish praise on his skills and work ethic. "He is the most effective person I've seen in the government," says Deputy National Security Adviser Denis McDonough. The political turmoil spreading across the Middle East may complicate Brennan's job. The autocratic regimes in Arab countries like Egypt, Jordan, Saudi Arabia and Yemen are all crucial, if imperfect, U.S. partners in the fight against Islamic extremism. Brennan's role during this period, says a White House spokesman, is "to stay vigilant for the potential for a terrorist dimension to develop as the situation unfolds." Yet Brennan himself strikes a hopeful note. "There are certainly risks," he says. "But there are also opportunities." Even on the quiet days, the ones in which the world seems safe and calm, Brennan speaks to Obama several times. "Anytime I need to see the President," he says, "I just run up the stairs." Sometimes the news is good. He might dash in to tell him that a terrorism suspect has been captured, a bomb defused. Sometimes he just e-mails. When Scandinavian authorities arrested suspected Islamist militants in late December, he notified the President by e-mail with a Shakespearean reference in the subject line: "Something is rotten in Denmark no more."